I’m back! Sometime Saturday night our home was invaded by a small microscopic orgainsm we know as a virus. I am not sure if it was the flu virus or not both of us had our flu shot so who knows? Patti was laid up all day Sunday then Monday morning it found me then it took me all day yesterday to gain some normalcy. WOW! What a ride! It’s amazing how something so small you need a power microscope to see it can wreck that much havoc on our lives! But when you stop to think about the microscopic “world” with it’s virus’, atoms, protons, neutrons, electrons, and DNA it’s a pretty big/small world. But then there’s the world of the Holy Spirit and using the most powerful electron microscope or telescope you’ll never see it. Jesus speaking about the Holy Spirit put it this way. “The wind blows where it pleases, and you hear its sound, but you don’t know where it comes from or where it is going…” (John 3:8, HCSB) When it comes to the wind we know it is controlled by other forces such as atmospheric pressure, warm air, cold air, storm conditions, but when it comes to the Holy Spirit there is only one force in control. GOD! “But the Counselor, the Holy Spirit —the Father will send Him in My name—will teach you all things and remind you of everything I have told you. Peace I leave with you. My peace I give to you. I do not give to you as the world gives. Your heart must not be troubled or fearful.” (John 14:26–27, HCSB) Of all the verses concerning the Holy Spirit these two are among my favorite. Verse 26 promises me God sends the Holy Spirit into my life and God has total control. And verse 27 promises me with God in total control I can take comfort in the fact that the peace I can and will experience is Otherworldly and is not controlled by any earthly forces. We think to live is peace is to live in a world absent of conflict, difficulties, adversities, and other forces that disrupt our lives including those pesky tiny virus’ thinking that way may bring temporary tranquility but not the peace each and everyone of us hungers for. My take-away lesson this morning is: God is exclusively personalizing your life on a daily basis with his Divine Representative, the Holy Spirit. It is the Spirit’s responsibility to bring light to darkness, shade from the false light from the world, peace in calamities not peace from calamities, hope when all seems lost, to love and accompany you into infinity and beyond. 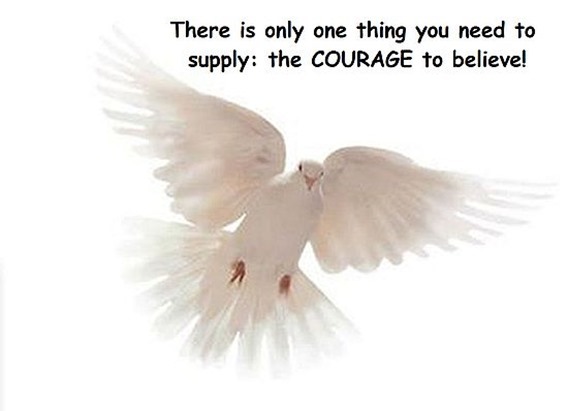 There is only one thing you need to supply: the COURAGE to believe! Am better but it sure seemed like I was blindsided by a semi truck! Funny thing is I had a flu shot! Glad I did might have been much worse without it. I often wonder when we are suffering with the flu or a bad cold or some other temporary illness if God suffers with us what are His symptoms? Then I wonder what kind of a dumb question is that? Oh, the twists and turns our minds take when wondering by themselves! Before I sign off I write for a website, http://www.nsministries.com/ do you think you could be a quest author from time to time?